Rye goodness. 4 packs of 4 slices. Packed with pumpkin seeds. Source of protein. High in fibre. No artificial ingredients. Suitable for vegetarians. Kosher - KLBD.Feeling Creative? Our Crunchy Rye Breads go with pretty much anything, but we love Pumpkin Seed & Oat paired with soft cheese and cherry tomatoes. At Ryvita, we think Rye is pretty special. It's rich in Fibre and is a natural source of Iron, Magnesium & Zinc. That's why our Crunchy Rye Breads are baked with Rye, to give you an easy way to get more Goodness* into your day. *A diet high in rye fibre contributes to normal bowel functions as part of a balanced diet and healthy lifestyle. 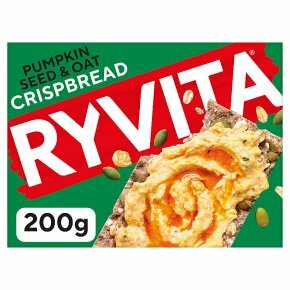 Ryvita Crispbread is high in rye fibre.